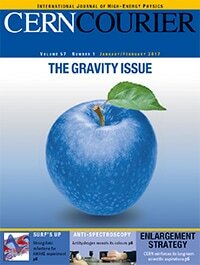 The CERN Courier published a special edition on gravitational waves, exactly one year after the announcement of the first ever direct detection. 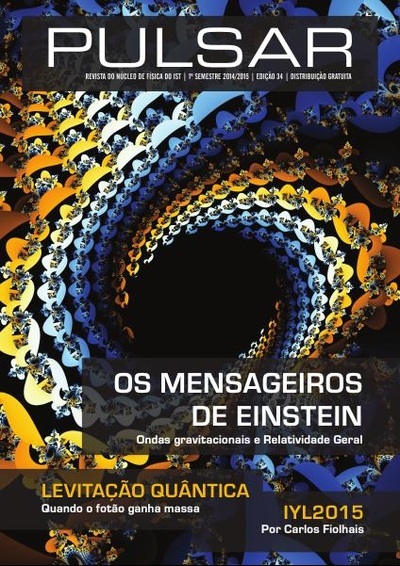 Among the invited articles, a piece by Vitor Cardoso and myself describes how gravitational waves can be used to inform us on the nature of compact objects, or even on the existence of very light particles. 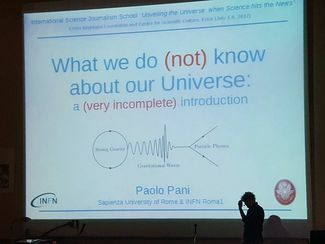 Opening lecture @ the International Science Journalism School "Unveiling the Universe: when Science hits the News"
Dec 22, 2016 - Attilio Ferrari ​ ​- La Stampa - "La prossima odissea sarà nel “fireball” la sfera di fuoco del buco nero"
Dec 9, 2016 - Zeeya Merali ​ ​- Nature News - "LIGO black hole echoes hint at general-relativity breakdown"
Jun 15, 2016 - Clara Moskowitz ​ ​- Scientific American - "Gravitational Wave Observatory Finds More Colliding Black Holes"
May 9, 2016 - David Larousserie​ ​- Le Monde - "Trous de ver ou trous noirs?" May 5, 2016 - Luca Fraioli ​- Repubblica - "Buchi neri o "gravastar"? 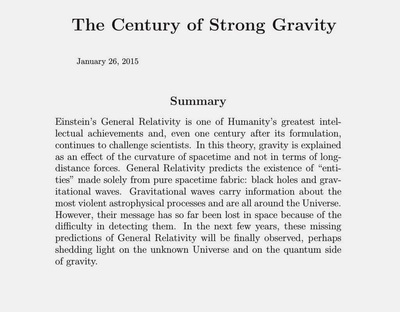 La scienza si divide sulle onde gravitazionali"
May 4, 2016 - Jacob Aron ​- NewScientist - "Was gravitational wave signal from a gravastar, not black holes?" ​May 2, 2016 - Bob Yirka ​- Phys.org - "Simulations suggest other phenomenon besides black holes merging could produce gravity waves​"
Apr 29, 2016 - Tushna Commissariat ​- Physics World - "Are wormholes or 'gravastars' mimicking gravitational-wave signals from black holes?" Apr 27, 2016 - Michael Schirber - Synopsis in Physics - "Did Black Hole "Mimickers" Produce LIGO Signal?" Mar 2, 2016 - CQG+ - "Black-hole laboratories in the era of gravitational-wave astronomy"
​Dec 22, 2015 - Anil Ananthswamy - NewScientist - "Dark matter's true face could be unmasked by pairs of dead stars"
﻿Jun 11, 2015 - Claire Fullarton - CQG+ - "Black-hole superradiance and the hunt for dark matter"
Feb 5, 2014 - Marcus Chown - NewScientist - "Black hole bombs: Are they dark matter in disguise?"